You approach Mon Repos via a wooded drive (above). The house is in a clearing at the top of the hill(below). Several rooms on the ground floor have been restored. Other parts of the house are devoted o archaeological displays. The grounds immediately outside the house include a small formal garden. On the opposite side of the house is a panoramic view of the sea. 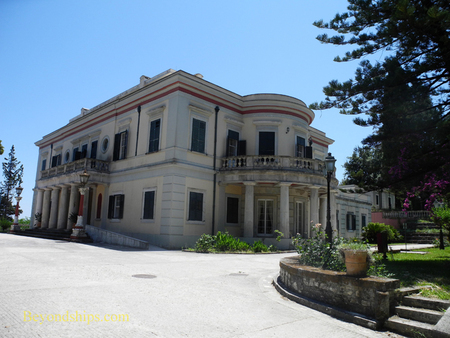 Somewhat closer to Corfu Town, high atop Analipsis Hill in the Kanoni area is another palace of escape, Mon Repos. It too has a somewhat turbulent story. After the defeat of Napoleon, the Ionian Islands became a British protectorate. Accordingly, the British government dispatched Frederic Adams to Corfu to act as High Commissioner and govern the island. One thing that no one expected was that Adams would fall in love with and marry a local woman, Nina Palatianou. 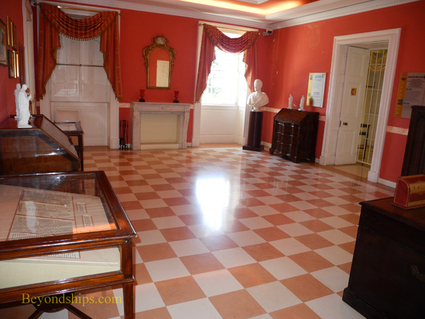 The British had built a palace for the High Commissioner in Corfu Town. (The Palace of Saints Michael and George, today the Asian arts museum). But Nina did not want to live in hot and busy Corfu Town. 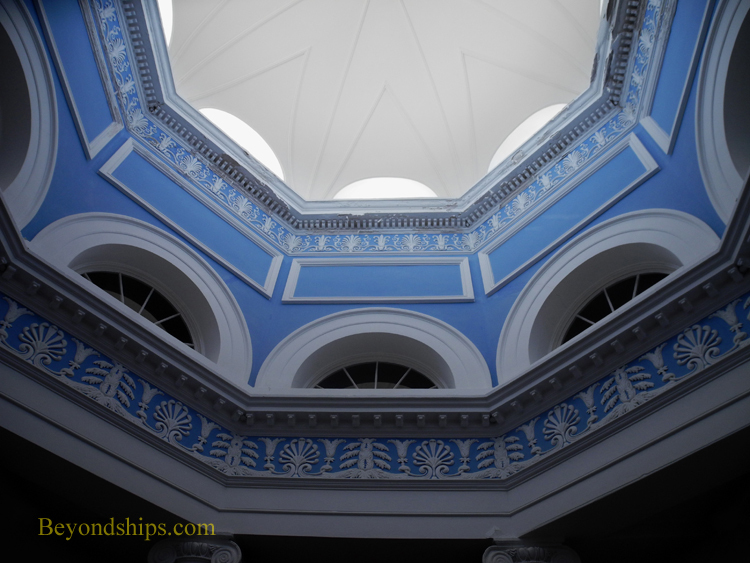 Therefore, as a token of his love, Adams had Mon Repos constructed as a country retreat. Unfortunately, the two lovers did not live there very long. Shortly after Mon Repos was completed in 1831, Adams was transferred to India. Mon Repos became a residence for Adams’ successors and then later a school for fine arts. 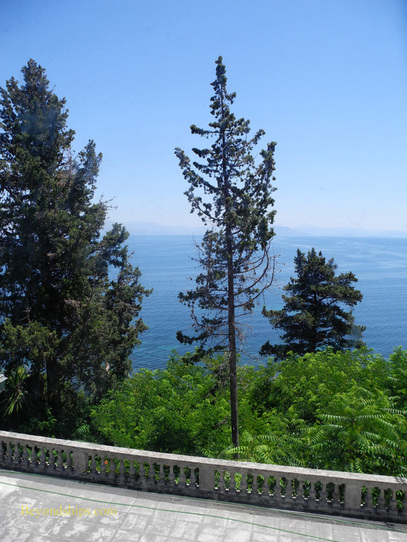 Eventually, in 1864, when the Ionian Islands were united with the Kingdom of Greece, Mon Repos became a summer residence for the Greek royal family. One interesting fact about the modern Greek royal family is that they are not of Greek ancestry. The family came to the throne after the overthrow in 1862 of the first king of the independent Greek state, Otto of Bavaria. In a referendum, the Greek people voted to have Prince Alfred, second son of Queen Victoria, become their king. However, this proposal did not sit well with the other great powers of the time and so the Greeks turned to the Danish royal family, which also had ties to Queen Victoria. This is how Prince Phillip, consort of Queen Elizabeth II of the United Kingdom, came to be born at Mon Repos in 1921. While his father was the seventh son of the King of Greece, he was also a grandson of the King of Denmark. Although Phillip renounced his Greek titles and succession rights in 1947, Phillip was a Prince of Greece when he was born. 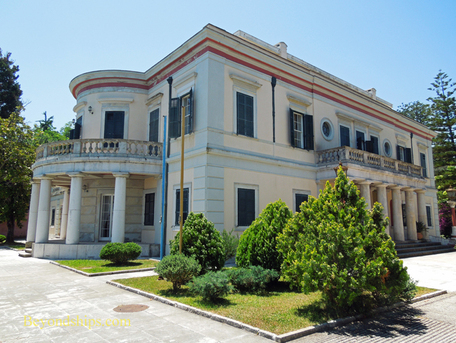 Mousolini's forces occupied Corfu during World War II and during that period, Mon Repos was the residence of the Italian governor. In 1967, when King Constantine II of Greece unsuccessfully attempted to lead a counter-revolt against a cabal of military officers who had taken over the government of Greece, the royal family had to flee. As a result, Mon Repos came into the possession of the Greek government. (The King subsequently tried largely unsuccessfully to obtain compensation for Mon Repos in the European Court of Human Rights). Mon Repos was allowed to become derelict but in the 1990s it was restored. Today, it is a museum open to the public. The gate for Mon Repos is at the base of the hill along a relatively busy road. Across the road are the ruins of the agora of the ancient city of Kerkyra Archeologists speculate that Mon Repos is built atop the rest of the ancient city. You walk up the hill to the palace through a park. 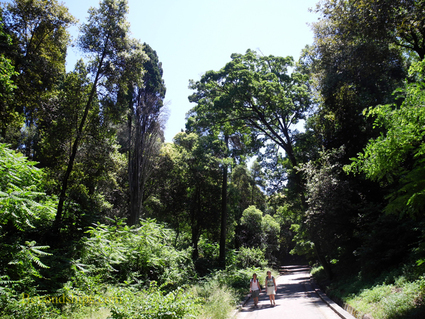 The tall trees provide cool shade against the sun, which can be quite powerful. In a clearing at the top of the hill, stands Mon Repos. 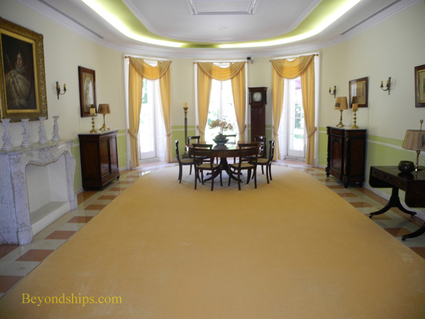 Like the Achilleon Palace, it is not a true palace but rather a Regency-style villa. Its white-painted neo-classical design suits the Mediterranean climate. Inside, several of the ground floor rooms have been restored to the days of Commissioner and Nina Adams. Through the portraits, you see the faces of the people for whom this palace was a home. Sadly, there is nothing on display relating to Mon Repos’ most famous resident. Although Phillip was only here as an infant, seemingly there should be something to tell the story. 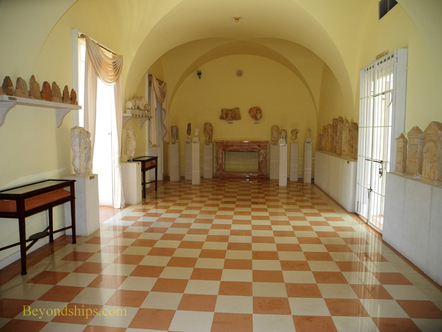 Rather, the remainder of the house is devoted to displaying archeological finds and telling something of the ancient history of the area. Mon Repos has a peaceful feel. It is quiet and the tall trees shelter it from the modern world. Indeed, there is more of a connection to the past than the present. 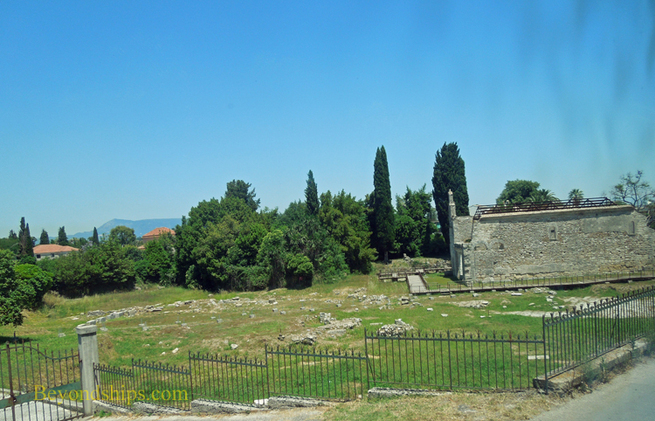 Above: The ruins of the agora opposite the gates to Mon Repos.